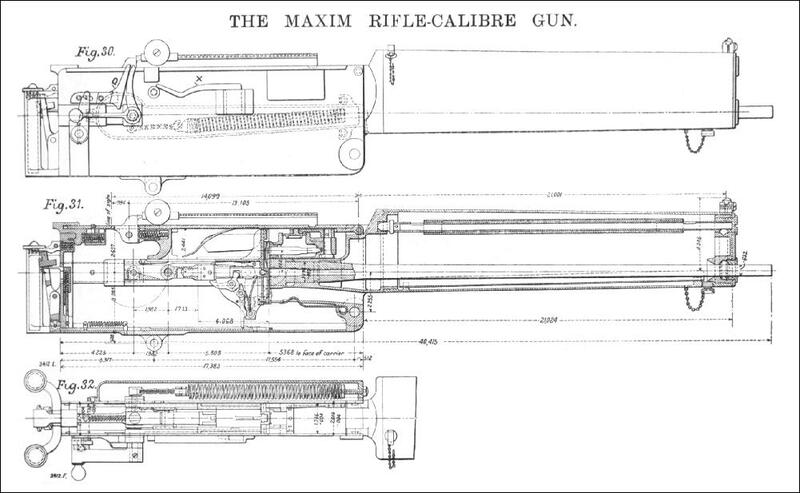 Maxim rifle-calibre machine guns, as they had evolved in 1898, are described in this second part of 4 -part article in the Engineering journal of 1898, published February 25 1898. The figures have been interspersed within the text to improve clarity. Transcribed by rob.b1904 (March 2011). THE MAXIM GUN. - No. II. Maxim guns are being manufactured at the works of the company at Erith and Crayford, also at the company's works in Sweden and in Spain. In addition, the British Government make these guns at their own factory, and the company have arrangements for the manufacture of their guns with the leading ordnance firms on both this and the other side of the Atlantic. The business of the Maxim Company has, since January 1 1898, been taken over by the firm of Messrs. Vickers, Sons, and Co., Limited, of Sheffield and Barrow-in-Furness, in consequence of which they have now adopted the name of Messrs. Vickers, Sons, and Maxim, Limited. In the British Army the rifle calibre is .303 in., or 7.7 mm., so as to take the Government army ammunition used in the Lee-Metford rifle. In this way ammunition could be served out indiscriminately to the infantry for rifle-firing, or to the Maxim guns. 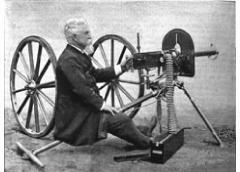 In the Royal Navy, Maxim guns have a calibre of .45 in., or 11 mm. The .303 bullet weighs 215 grains, and is made of lead with a nickel casing. The .45-in. bullet weighs 480 grains, and is all lead. Both bullets are practically the same length. As shown in Fig. 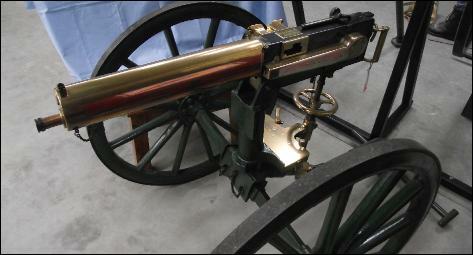 25, the Maxim gun can be mounted for firing on a tripod detachable from the wheel-carriage. The general arrangement of tripod and gun lends itself admirably to transport. 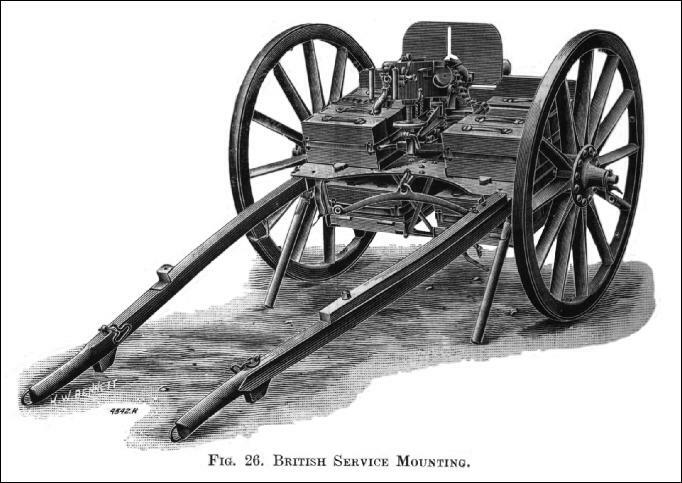 This tripod, however, is not employed in the British service, as guns in charge of infantry are mounted on wheeled field carriages adapted for horse draught as shown in Fig. 26. In this view the barrel is almost hidden by the shield, but the mechanism of the gun is shown. As will be seen, the gun is in act of being fed by a belt of cartridges from one of the ammunition boxes. The carriage has 16 boxes of ammunition of 250 rounds each, or 4000 rounds in all. The total weight, - about half a ton, - is drawn by one horse. There is no place for the men to ride, as the gun is supposed to accompany infantry at a marching pace. The carriage is strongly built, so that it will go across rough country. There are several of these infantry carriages in the British Army, whilst other types of carriage are supplied to foreign Powers, some other governments preferring a carriage with limbers to detach, thus giving four wheels, as used in the 37-millimetre gun, which will be illustrated and described later. We will now proceed to describe as concisely and clearly as possible the mechanism of the most modern form of Maxim automatic gun. Our readers will remember that, in connection with the Naval Exhibition of 1891, we gave illustrations and a somewhat detailed description of the Maxim gun. Since then some alterations have been made and we therefore bring the matter up to the present date. In doing this we shall have to repeat to some extent what has already appeared, but this is unavoidable if we would make the explanations intelligible. We also reproduce some of our former illustrations. The gun is, for purposes of classification and description, divided into two parts, which are respectively recoiling and non-recoiling. The recoiling part consists of the barrel, which is an ordinary rifle barrel, and two recoil plates which carry the lock and the crank. In Fig. 27 is shown the lock complete, marked G, and its component parts separately. This engraving will enable the parts in the outline drawings to be more readily discovered. Fig. 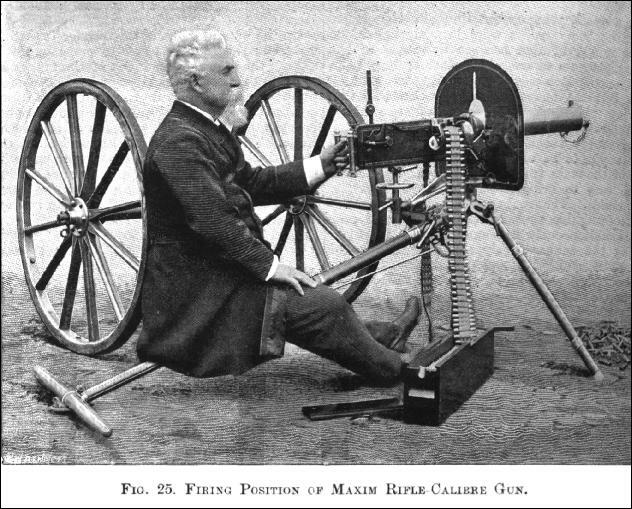 28 shows the rifle-calibre Maxim gun, with the outside plate removed. Fig. 29 shows the same gun with both the outside plate and feed block off. Figs. 30, 31, and 32 give respectively an exterior view, a longitudinal section and a plan, the latter showing the fusee spring box in section, and both the barrel and the water-jacket removed. The lock is secured by a divided or interrupted threaded screw to the connecting-rod A (see Figs. 28 and 29) so as to be easily removed. The connecting-rod is actuated by a crank B, the shaft C of which passes through the recoil plates E. There is a handle to the shaft on the right of the gun. This is outside the outer plates, but is shown in both Figs. 28 and 29, as well as in Fig. 32. There is a slightly curved arm to the crank marked F.
This arm is also outside the outer plate, and is shown in the three last-named engravings. The trigger H is shown in the separate part (Fig. 27) and also in Fig. 29. There is a sliding bar which actuates it, marked S, shown in Figs 28 and 29. This bar is operated by a lever in the rear of the gun, by means of pressure being applied to a double button on the upper end of the lever. On pressing the button the rod S is drawn back and this releases the tumbler K and firing pin L, the latter being shown separately in Fig. 27. In the rear of the gun is a safety-catch M (see Fig. 28), which, when down, prevents the lever being pressed forward. 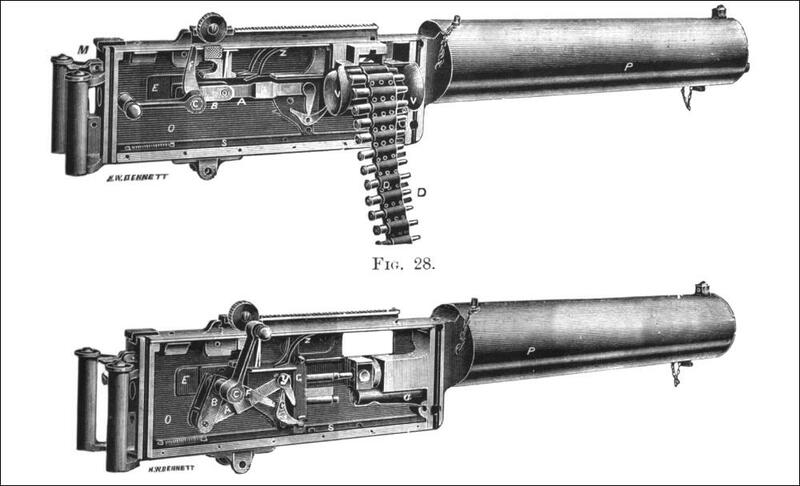 The non-recoiling portion of the gun consists of the breech-casing, or outside plates O which enclose the whole mechanism and the water - jacket P round the barrel. 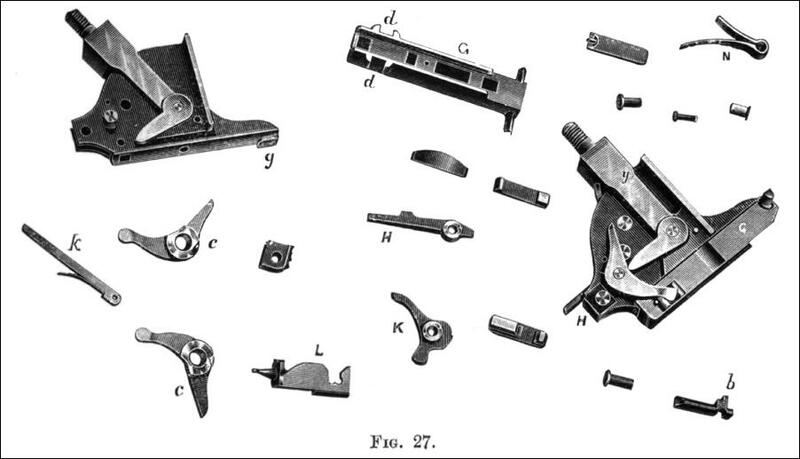 On the right-hand side of the breech-casing is a solidly attached resistance-piece marked Q in Fig. 30. When the breech is closed, the curved arm F of the crank B is either touching or a small distance from, the resistance-piece. On the left side of the gun there is a strong spiral spring, the position of which is shown in Fig. 30, the rear end of which is connected by a chain and fusee with the crankshaft C, and the fore end is attached to the breech-casing by means of the spring-box as shown. The use of this spring is to bring back the barrel after recoil, and to work the crank. The water-jacket is of gun-metal and surrounds the barrel. It has three openings, one for receiving and one for drawing off water, the third being for letting out steam. The cartridges are fed in by means of a belt which passes through the feed-block V, Fig. 28. In the feed-block are two movable and two stationary pawls. The former are connected by a lever to the barrel, the latter on recoiling, moving them from left to right. By means of a spring the pawls are made to engage behind the next cartridge in the belt, and the cartridges are thus moved on automatically towards the chamber. The barrel returns after the recoil and the pawls place the cartridge which still remains in the belt, immediately above the chamber. In firing the gun when the first round has been discharged, but the recoil has not taken place, the breech is closed by the lock, which is held in position by the connecting-rod A of the crank B. The latter being then above the horizontal position, the breech cannot be opened excepting by turning down the crank, as it is stopped by suitable mechanism from going up. The pressure due to the explosion of the cartridge has no tendency to make the crank descend. The base of the cartridge which is in the barrel is seized by the carrier G, as is also the base of the next cartridge in the belt. The groove for taking the base of the cartridge is plainly shown in the engraving of the separate parts. The gun has already been fired by pressing the button at the rear end of the gun. This draws back the trigger-bar and releases the firing-pin. This part of the mechanism is shown in Fig. 31. On the explosion of the cartridge, the barrel recoils about 1 in., and this drives the crank-arm F against the resistance-piece Q, thereby rotating the crank. This will bring the end of the crank handle on to a buffer-spring X, Fig. 30. The curve of the arm is so formed that the crank gets an accelerated motion, so that the lock, – which is connected to the crank B by the rod A, – is thrown sufficiently clear of the breech to extract, by means of the carrier G, the empty case from the barrel and the fresh cartridge from the belt. The turning of the crank winds the chain attached to the fusee spring, thus extending the spring. As the lock goes backwards the carrier G is pressed down by the cover springs Z, and when the carrier is in its lowest position the new cartridge is opposite the barrel and the empty case opposite the ejecting tube a, Fig. 29. The barrel is brought forward again to the position occupied when ready for firing by the action of the fusee spring. The latter also unwinds the chain from the fusee, thus turning the crank to the firing position with the lock brought forward. The returning of the recoiling portion is rendered quicker by the action of the crank handle striking on the buffer spring. As the lock moves forward it pushes the new cartridge into the barrel and the empty case into the ejecting tube. During the last portion of the forward travel of the lock the carrier G is raised by lifting levers e, Figs. 27 and 29, which are acted on by the points of the side levers y, Figs. 27 and 29. When the carrier is in its highest position it is retained there by a spring known as the carrier holding-up spring. This insures the centre of the base of the cartridge being opposite the firing-pin hole. The carrier has a grooved projection for two-thirds of its length; and, therefore, in rising, it releases the empty case, which is held in the ejecting tube by a spring, and, therefore, cannot fall back. The ejecting tube is shown in section beneath the breech end of the barrel in Fig. 29. The carrier also grips the base of a fresh cartridge in the belt. The extent of the upward movement of the carrier is regulated by a projection on the lock g Fig. 27. As the lock is brought away from the breech by the action of the crank, the rear end of the side lever y presses down the tumbler, thereby pulling back the firing-pin and compressing the main spring. When the tumbler is down the main spring causes the short arm of the trigger to engage under the bent of the tumbler. There is also a safety sear k, Fig. 27, which holds back the firing-pin, and which must be lifted before the lock can fire.